New family of anode materials can double the charge capacity of lithium-ion battery anodes. AUSTIN, Texas — The batteries we use every day may soon become cheaper, smaller and lighter. Researchers in the Cockrell School of Engineering at The University of Texas at Austin have discovered a family of anode materials that can double the charge capacity of lithium-ion battery anodes. This means that the batteries that we use in everything from cellphones to large-scale energy storage systems could be more efficient in the future. Recent efforts to improve lithium-ion battery electrodes have focused on building new nanomaterials atom by atom. Manthiram and his team, which includes postdoctoral fellow Karl Kreder and materials science and engineering graduate student Brian Heligman, developed a new class of anode materials in which eutectic metal alloys are mechanically rolled into nanostructured metal foils. Since the 1990s, the primary anode for mass-produced rechargeable lithium-ion batteries has been a graphite powder coated on a copper foil. The copper adds bulk to an electrode without improving the battery’s power and the anode requires a laborious, fastidious manufacturing process. By omitting the complicated slurry coating process, the manufacturing of the IdEA anode is drastically simplified. Kreder, who is the lead author on the study, realized that a micrometer-scale alloy anode could be transformed into a nanomaterial using traditional metallurgical alloying processes. 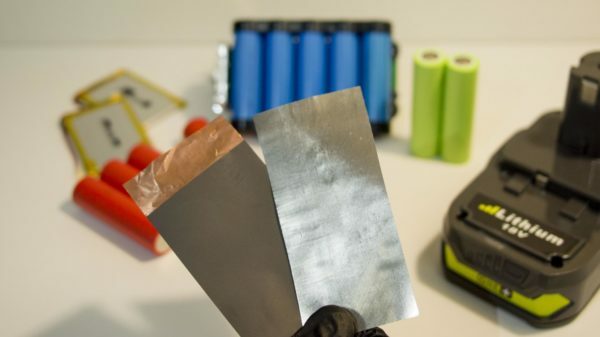 The team’s resulting anodes occupy significantly less space, overcoming a critical barrier to commercializing better batteries for use in portable electronic devices like cellphones and medical devices, as well as larger applications like electric cars. The research was published in the journal ACS Energy Letters. It was funded by a grant from the U.S. Department of Energy’s Office of Basic Energy Sciences, Division of Materials Sciences and Engineering.